This morning when I was going through Trevor's backpack I found his spring pictures. I tentatively opened them up, hoping that he didn't do some goofy grin. Or his hair was all crazy. I have the cutest kid in the WORLD. I feel a few tears coming on. Nothing cooler than that. Mother love is the best! 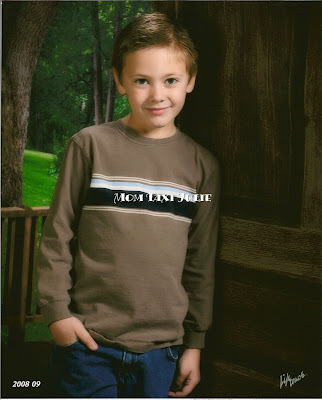 That's a GREAT school picture... and yes, he is adorable! Ohhhh...I LOVE perfect school pics (you know what I mean...no need for retakes).